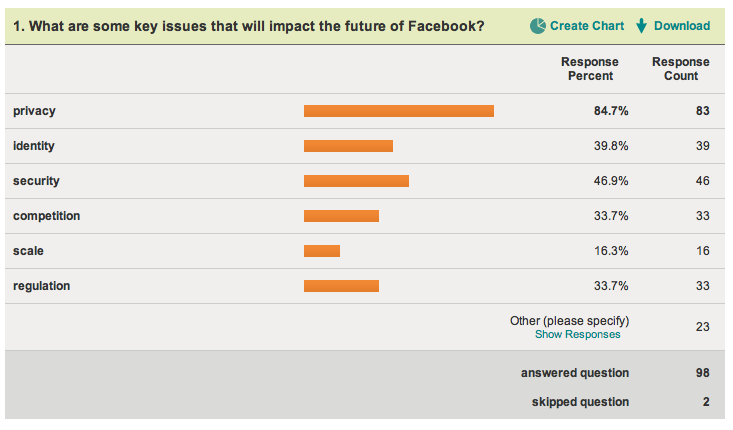 Thanks to everyone who participated and responded to the 4 question survey for the Future of Facebook Project. Below are your results! 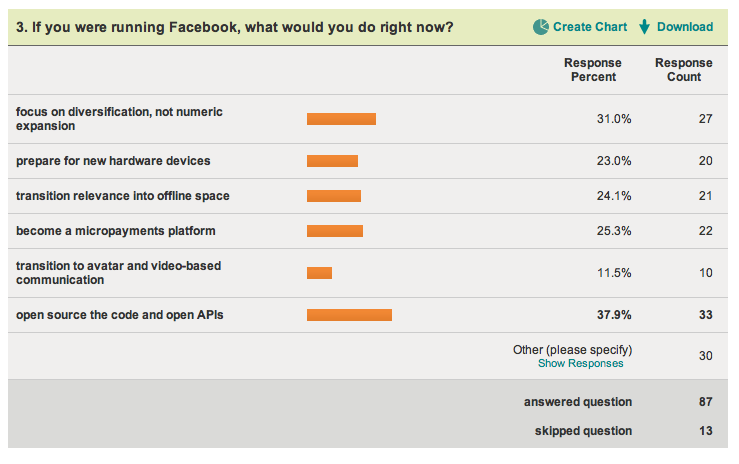 We’ll be integrating these responses with the ones given by the experts for our final video and written report. 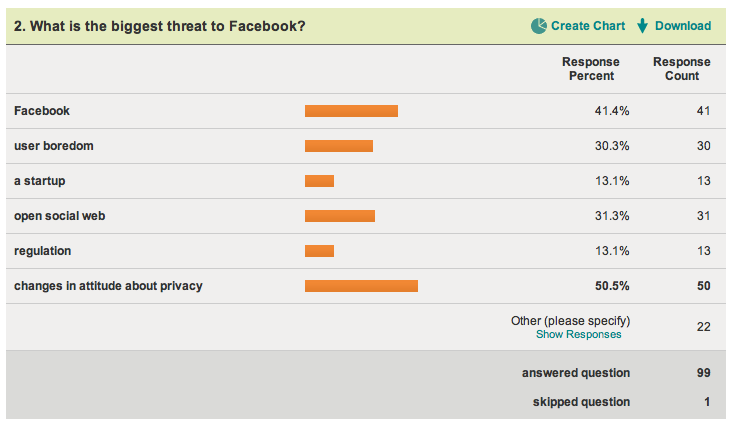 In the ‘other’ category, responses included: personal data ownership, trustworthiness/transparency, boredom/fatigue. In the ‘other’ category, responses included: data loss breaches, nonstop changes that make it harder to use/illogical user interface, feature bloat, distributed peer-to-peer solutions from the open source community. In the ‘other’ category, responses included: a peer to peer vendor like Napster was – connecting everyone but controlling nothing, self-organized social business, personal control of generated content in the cloud with sharing and social and user monetization, information technology that supports people to solve problems they care about, and making it easy for any business to build a customer service interface without any lock-in to a specific host or vendor. 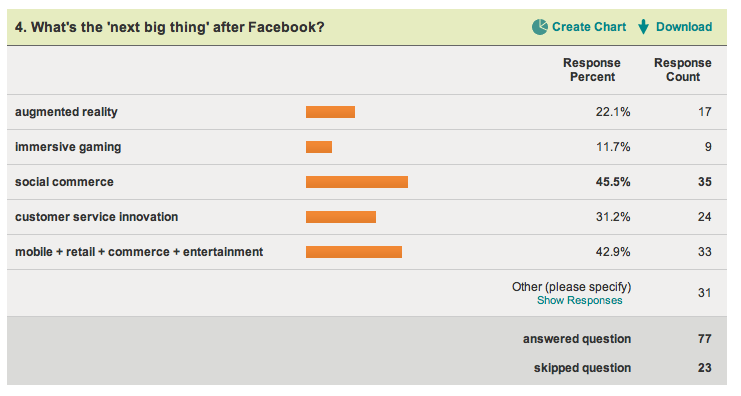 I’m afraid it’s very optimistic to think people will change their attitude towards privacy. I think the trend is for people to realize that privacy on-line is an illusion and that the best approach to Facebook is to make everything public and only post stuff that you’re willing to share with everyone. If you want to keep something private, don’t share it electronically. (Duh.) You can’t rely on third parties (ie, any service provider) to keep private stuff private. But I think we’re still in the early adopter phase for that attitude regarding privacy. Facebook appealed to people because it led them to believe they could post stuff electronically and control its distribution. Now they’re learning that this doesn’t work, but many will keep posting things anyway, and just become more selective about what they post. In 5 years, the whole “privacy” issue may just go away.